First time poster but long time reader of this forum. I’ve been DMing a 5E campaign for my wife and 2 friends. I used to play 3.5 back in High School and then took a long time away from D&D, but we're loving 5E! I am a bit worn out on the typical Faerun setting, so we shipped the party off to Maztica. I’ve seen various permutations of rule sets in 3.5, AD&D and others for the Maztican ball game but unless I’m missing something obvious I hadn’t seen a stab at ball game mechanics for 5E. Furthermore, all the rules for previous editions I found were overly complicated and made the Ball Game so slow that it was a poor simulation of an up tempo sporting match. We play again in 2 weeks and if any of you have the time I would be thrilled if you could play test my rules and mechanics and provide some constructive criticism. The mechanics I’ve used are Movement Speed, Dex, Athletics, Acrobatics and Sleight of Hand. The Maztican Ball Game is the most popular sport in the True World, matches are a near religious experience. The Ball Game is played by 2 teams of 4 players each (to match the average D&D party, scale to your needs). The game is played with a 6 inch diameter solid rubber ball (made from native Maztican rubber tree plants) on a compacted earth clay surface. The game is something of a combination of hockey, basketball, handball and soccer. The court is 50 feet wide by 100 feet long and sunken 30 feet below grade with solid stone walls on all sides. Grandstands rise up from the edges of the walls on all sides. The court is divided in 2 halves by a midcourt line. At the midcourt line, 15 feet up on either side is a vertical ring 12 inches in diameter. Along either baseline is a goal that is recessed into the wall, the goal is 20 feet wide, by 10 feet high, by 5 feet deep (These goals have retractable fences and double as holding pens for combatants/wild beasts when the arena is used for gladiatorial combat). A dashed line 20 feet from each goal runs the width of the court. Another dashed line surrounds the vertical rings at a distance of 10 feet. There is a cross mark at center court. The first team to 3 points wins the game. The best out of 3 wins a match. Most afternoon contests consist of a single match. In playoff or tournaments longer set or series can be played which is the best out of 3 matches. Throwing the ball into your opponent's goal earns you one point. Throwing the ball through a vertical ring earns your team 3 points, an automatic victory for that game. This is exceedingly rare and doing so will make that player something of a local legend. Shots can only be attempted from inside the associated zones (i.e. from within 20 feet of a goal, or 10 feet of a vertical ring). The game begins with 1 player from each side coming to center court at the cross mark. A referee holds the palm of his hand. On his whistle each player attempts to smack the ball out of his hand, backwards towards one of their team-mates. This “slap ball” procedure is repeated to get the ball back into play after a goal, or if it is ever knocked into the grandstands. This is the only time a player may touch the ball with his hand on offense. The ball can be advanced by touching it with any part of your body except feet and hands. The ball can be advanced by “dribbling” it on one's knees in sort of a high-stepping motion, or with their elbows by bouncing it off the court. More often though the ball is advanced via passing. Opponents may use any part of their body, including feet and hands (though they may not grasp the ball, just knock it down) to intercept a pass or block a shot attempt. Shoving or “checking” is totally legal, and a fan favorite part of the game. Players may begin the game wherever they like, so long as they are behind their team mate who is participating in the “slap ball” (in other words, on their side of the court). The use of magic, weapons and racial magical abilities (like misty step) are strictly forbidden in the ball game. Start by rolling initiative for all players as you would in a standard combat. Each team picks one player to go to center court to participate in the “slap ball.” Each player makes a Sleight of Hand check, the player with the higher score successfully knocks the ball back to a team mate of their choice. Actions are basically the same rules as in combat. Players can move, dash, disengage, attack (though the only attack allowed is a shove/check), steal, block, pass, dribble and shoot. Dribble: A player must succeed on a DC5 Athletics check to get the ball under control to dribble it with their knees or elbows. If successful the player can then move, but their movement is slowed by 5 feet (dribbling a hard rubber ball is tougher than just running straight ahead). Dash: As in combat, same rules apply. Pass: A player must succeed on a DC8 Athletics check (we tried 10 initially, it seemed too hard in our play test) to pass the ball. The ball can be passed 30 feet. For every increment of 5 feet beyond 30, add 2 to the DC. On a failed check the ball is fumbled and is now a loose ball in that players square, any other player within reach can obtain the ball as a bonus action. Passes can be bent (like Beckham) up to 45 degrees at a cost of ½ the passes travel distance. Passes can also be bounced off the sidewalls and rickashay in a direction the passer intends at a cost of ½ the passes travel distance. Receive a Pass: Receiving a pass is done as a reaction to a ball coming into a player's zone, and thus doesn’t take an action or movement. To receive a pass a player must succeed on a DC5 to successful receive and control a pass. On a failed check the ball is fumbled and is now a loose ball in that players square, any other player within reach can obtain the ball as a bonus action. Intercepting a Pass: As a reaction, a player can intercept a pass with a DC15 sleight of hand check when the ball goes through a square within their reach. If the ball passes through the square the player is occupying they are at advantage to intercepting it. Stealing the Ball: Any player within reach of the player possessing the ball can attempt to steal it. Each player makes a Sleight of Hand check, the winner now possesses the ball. 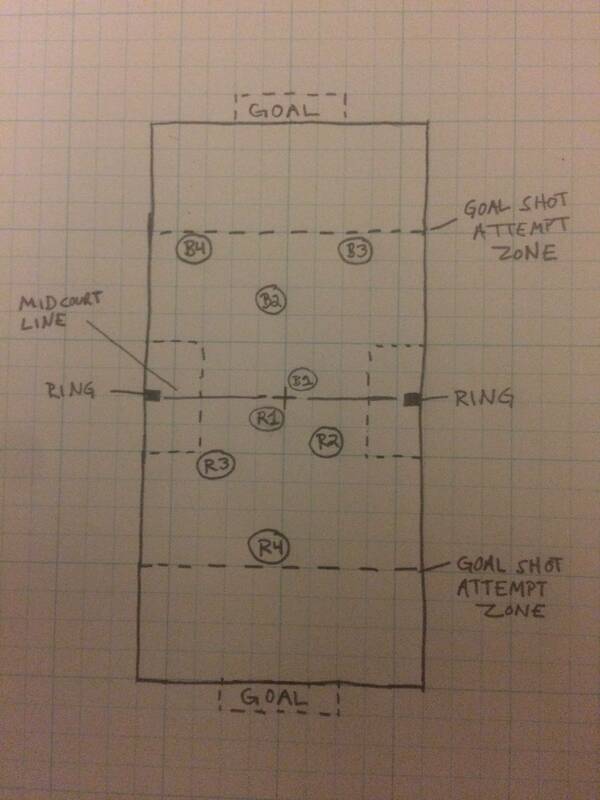 Goal Shot: Any player within the 20 foot strike/attack zone may attempt a shot on goal. It is a DC10 Athletics check (we initially tried DC15, it made scoring too infrequent) to shoot. (The 2 DC difference between passing and shooting is meant to represent the pressure associated with taking a shot). A failed check results in the ball being fumbled, it is now a loose ball in that players square and any other player within reach can obtain the ball as a bonus action. Ring Shot: Players may attempt to score on either vertical ring. Any player within the 10 foot strike/attack zone of a vertical ring can attempt a shot. A successful DC20 Athletics check is required to put the ball through the ring and score! A failed check results in the ball being fumbled, it is now a loose ball in that players square and any other player within reach can obtain the ball as a bonus action. Blocking a Shot: As a reaction, any player with reach of a player shooting, or within reach of where they are aiming their shot, can attempt to block with a DC15 Athletics check. On a successful block the player who blocked the ball can either rickashay it 10 feet in any direction or posses the ball. On a failed check, the ball scores! Shoving/Checking: Players may shove opposing players (or their teammates I suppose if they really wanted to) as they would in combat. Strength (Athletics) vs. Acrobatics or Athletics (victim's choice). If the shove succeeds the shovee is knocked prone. Help: As in combat players can help one another. If a player is within reach of a teammate they can help them on their next action, this provides advantage. This could be something like setting a pick in basketball, or perhaps lifting their teammate up into the air to help them get a shot off over the crowd. Delay: As in combat, a player can delay their turn in initiative and trigger it as a specified time. Wall Run: Players can run up the side walls, up to ½ their speed, with a DC15 Acrobatics check. This has multiple uses: A player can wall run to be out of the reach of an opponent's opportunity attack. More notably though wall runs are often used to help score Ring Shots. A player can attempt to wall run, receive a pass and then shoot a ring shot. A Ring Shot attempted from a position on the wall is at advantage (unless of course an opponent is has also done a successful wall run and is within reach). Obviously players can’t finish their turn on the side of the wall, should they attempt to they fall prone (a price well worth paying if you’ve just scored a Ring Shot). The best way to score on a wall run alley oop is to have Player A possess the ball. Player B attempts the Wall Run while Player A delays their action. Once in position up the wall Player A fires a pass to Player B who can still receive the pass and attempt to shoot it through the ring. Opportunity Attacks: As in combat, be careful crossing through your opponent's reach, he may shove you over! What I need your help with is: Do the DCs seem reasonable (our party is a mix of levels 3-5)? If you have time to play test it, was it simple enough and fun? What would you change? What did you like? Should I add a grappling feature? Should shots be allowed from greater distances, just at a higher DC? Thanks a million for any feedback you can provide. I know I'm using Sleight of Hand in a sort of weird way, but I was trying to come up w/ a skill that would give players who don't have a ton of Athletics skill to still have some success in the game. *Any time a player receives the ball on a pass, as a reaction/free action they can either shoot or pass immediately. This keeps the ball moving faster and adds some fun strategy elements. *Players can attempt shots from outside the associated "attack zones". The first 3 squares beyond the goals are at a DC15, the next 3 are DC20, you can't shoot from beyond half court. For ring shots, the next 3 squares outside the main attack zone are at DC30, then DC35 beyond that (which, why would you try that? Why not just shoot on the closer goal? But we thought we should allow it). *Missed shots on goal result in the ball being fumbled in front of the goal and become a loose ball there, not where the shooter was. *Dribbling shouldn't take a DC5 check to see if you can dribble. You can dribble and move with the ball, but at a penalty of 1/2 your movement. Anyway, if anyone gets time to try it out, let me know what you think! Hello HooverDam. Welcome to The Piazza! You might want to pop over to Ashtagon's "Introduce yourself here topic and say "hi" to the community at large. I don't play 5e myself, but it looks like a lot of your mechanics are actually edition neutral. So maybe it would be fairly easy to retro-convert your rules to other editions. I'll see if I can get you a bit of "signal boost". I'm really looking forward to seeing what sort of forum avatar a HooverDam has. If you do start posting in other parts of the forum (and I hope you do), you might want to add a "Help me playtest Maztican ball game for 5e" link to your forum signature, to make it easier for people who talk to you to find this topic and join in with your playtest. ^ Thanks for the welcome and the tips! I really love this version of the ball game. When i wrote up the campaign guide, which essentially updated the 2e boxed set to 5e, I left it out almost completely and that is one of my biggest regrets about the project. This, in itself, could make a wonderful netbook or Dmsguild project. In addition to the rules of the game, you could make some pregenerated teams, possibly some locations of well known courts (an import to mainland Faerun? ), and even some prizes that could be given to victors of a tournament. I was in Coba Mexico a few years ago. Fascinating archeological site and game ! Last edited by shesheyan on Mon Dec 04, 2017 1:34 pm, edited 3 times in total. Oh those are some fantastic photos. Gives a good idea of how difficult it must've been to score that three pointer. It's amazing how much like basketball this game is - I wonder if there is a connection. By the way, in the modern day, the game's name is apparently Ulama. That name is descended from what the Aztec's called ōllamaliztli. Seethyr wrote: Oh those are some fantastic photos. Gives a good idea of how difficult it must've been to score that three pointer. It's amazing how much like basketball this game is - I wonder if there is a connection. By the way, in the modern day, the game's name is apparently Ulama. That name is descended from what the Aztec's called ōllamaliztli. Having been there in person and having seen the angle and height of the slops, it must have been very difficult to score. Not surprising it was a 3 point auto-win. The indigenous tour guide told us the game evolved over time. Towards the end of their civilisation players were selected at a very young age and trained until they were ready to play. They did not have to work and had special privileges. Apparently, prior to the game, players drank a beverage made with 100% pur cocoa and chili pepper spices to give them courage and stamina. The winners were ritually sacrificed in the name of their god, which was considered a great honour for the family. Do you have any thoughts on the other version of the ball game, which is essentially "two villages play football against each other"? Been working on a project on this using HovverDam's stats with details to come. Some changes I have made. I allowed a number of the ability checks to to use EITHER Strength (Athletics) OR Dexterity (Acrobatics) in order to accomodate more types of players. Thematically, this can be explained away as players who use finesse versus those who try to brute force their way to victory. I also think that the DCs are perfect as is, but only for players of certain levels. They have to scale up, yet still allow for massive differences in ability. If you want to take into account that players might become injured, roll a Constitution save every time a player is knocked prone by either being shoved, or falling from a wall run. The save DC is 5 for being shoved and DC 10 for the wall run. If they fail the save, they are injured and must either make a substitution for another or continue to play while moving at half speed and taking Disadvantage on all game checks. Most venues will stop the game for a substitution, at which point a new Slap Ball occurs at the midcourt line. If the DM wants to include the effects of a home court advantage, each player on the team could be given inspiration on a single ability check during a game. This may also be given if the DM determines the crowd is particularly raucous for either or both teams during a high stakes, or championship game. Jürgen Hubert wrote: Do you have any thoughts on the other version of the ball game, which is essentially "two villages play football against each other"?